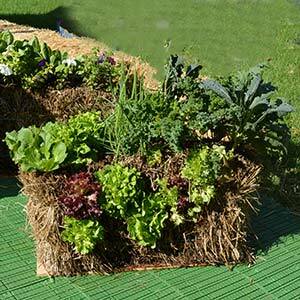 Call it a Hay Bale garden, or a Straw Bale garden, the method and instructions for this quick and easy ‘No Dig’ vegetable garden are the same. We look at how to make a straw bale garden and how to plant your vegetables. The difference between Hay and Straw. The major difference is that Straw Bales shouldn’t have seeds in them, Hay Bales have lots of seeds. However specific types of Straw have different characteristics, some are better than others. You do all of this yourself (DIY), however the people at BaleGrow, www.balegrow.com.au offer a complete kit with nutrients, selected straw bales and a comprehensive instruction kit. Straw Bale Gardening – Image from BaleGrow. The temperature of the bale will be higher than the soil and allows you to plant crops earlier in the season. Its a very easy system for children to be involved with. The secret is to prepare the bales 8 weeks before planting. This involves conditioning the bale, it really needs to be wet for a few weeks before planting to allow the heat that will be released when the bale first gets wet. The bale needs to be placed with the strings or binding on the sides, not on the ground. Some weed mat or cardboard beneath the bale will prevent weeds from growing up through the bale. Water again for one week. The bale will heat up and then begin to cool. Once the bale cools inside you are ready to plant. Create a hole in the bale and fill it with well rotted compost and aged animal manure. Use cow manure if you can get it. Plant your seedling and pack around it with compost and vermicaste. Straw does not have a lot of nutrients in it, so you will need to fertilise regularly. Use any good quality organic fertiliser. Water fertiliser in well so it moves down into the bales. Taller plants like tomatoes, will need to be staked for support. The stakes are best put into the ground next to the bale rather than through it. Bales will rot down over a year and the residue can be used as mulch, spread through the garden, or used as planting material for next years straw bale garden. Generally very problems arise if you choose the right bales and wait until the bale has gone through the heat process before planting. Choose bales that contain material that has not been sprayed with herbicides. Let the bales go through the ‘Cooking’ process first. They need to heat up and coool down before planting.